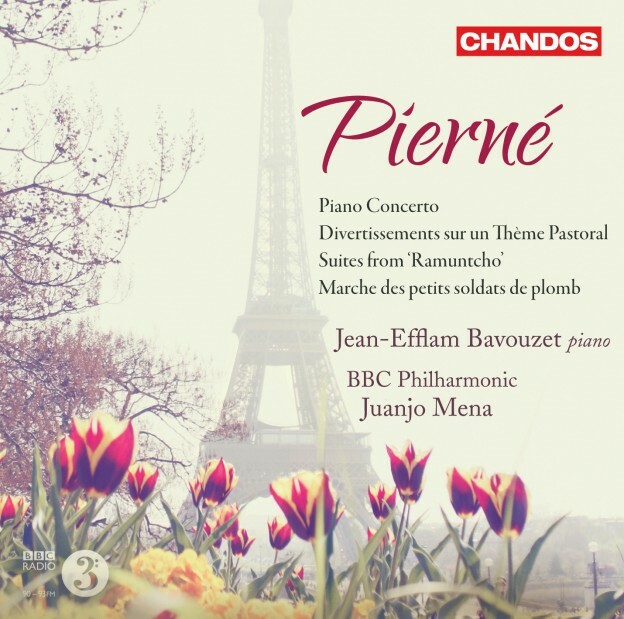 Whilst not now a household name, Pierné was a highly respected and very active composer / conductor in his day as well as a key figure in the French musical establishment (he even has a square named after him in Paris). He received the French Légion d’honneur in 1900 and in 1910 conducted the premiere of Stravinsky’s The Firebird. A pupil of Franck and Massenet, he wrote music with tremendous fluency and all his works were written with a characteristically light, French touch. Developing a style that combined the seriousness of Franck with the sensuality of Massenet, Pierné absorbed the essence of both teachers to produce a string of very attractive and tuneful orchestral pieces. The composer’s perhaps most famous work is the Marche des petits soldats de plomb (March of the Little Lead Soldiers) which enjoyed a great vogue up until recent years. This new recording reveals its catchy charms to new generations. This is Jean-Efflam Bavouzet’s third concerto CD for Chandos, following this year’s highly acclaimed accounts of the piano concertos by Bartók (CHAN 10610) and Ravel (CHSA 5084). That Bavouzet is a true master of the French repertoire is evident from his award-winning series of the complete works for solo piano by Debussy. He is here accompanied by Juanjo Mena, who in September 2011 will become Chief Conductor of the BBC Philharmonic and here makes his debut on Chandos. "These performances are stunning … Jean-Efflam Bavouzet is an unbeatable soloist, and the orchestral playing under Mena is irreproachable … plus terrific sonics and the result is simply irresistable. You’ll love this music." "…Aiding the performers, the BBC Phil and Juanjo Mena a partnership to watch it seems, co-producers Brian Pidgeon and Mike George, together with Steven Rinker’s dynamic and gorgeous sound, have come up with a 2011 Winner long before such Awards have been nominated, let alone chosen. There’s enough Pierné, including some more piano-and-orchestra pieces, for a second volume. Hopefully."